When summer is here, it means it’s pool time! You’re ready for some fun in the sun. The only problem is, your water could be warmer and leaves and other debris have drifted into the pool since the last time you cleaned it. And your chemical and water costs could be less. There’s a great way to warm your water, cut down on maintenance time and cut your costs, and that’s installing a pool cover. Solar, thermal, automated, winter, hidden pool covers. So what kind of cover should you get? 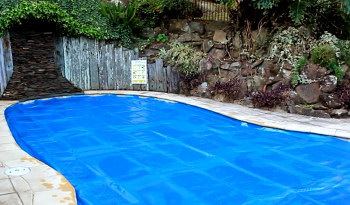 The different kinds of swimming pool covers each have their unique qualities. The key is learning what each one does in order to decide which one to buy. Below, we compare five of the different types to help you make this decision. They are made of a light durable material, and consist of air bubbles, not unlike bubble wrap. Light passes easily through these transparent bubbles to help facilitate heating in the same way that a magnifying glass works. Depending on the size of the pool, the price for a solar pool cover ranges from $40 (kiddie pool size) to $1,400. 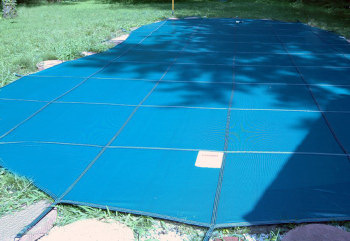 This is the only swimming pool cover that can increase the water temperature. It will raise the temperature of the water by up to 8 degrees by converting the pool into a solar heater and thereby extending your swimming season by weeks. Reduces evaporation by up to 99%, cutting down water costs. They also help keep in the chemicals necessary to keep a pool healthy and sanitary. This decreases the costs incurred from replenishing chemical supplies. Keeps dirt and debris out of the pool’s water, limiting how much chemicals are needed to sanitize the water, further keeping costs down. Lightweight and easy to use. This makes taking the cover on and off fast and easy. Difficult to roll take on and off unless you have a cover roller. Most people wouldn’t consider buying a solar cover without a roller though. Solar covers cannot withstand the weight of even a small child or animal. They require additional safety precautions like a fence or a gate that latches every time it is opened and closed. Don’t insulate the water as well as thermal covers. They do come with a hefty price tag but the benefits far outweigh the costs. Many people say the extra money is worth the piece of mind, not to mention, it’s pretty cool to be able to push a button and have it open and close on command. As mentioned above, they are pricey, and start at about $2500 and go much higher. SAFE! When installed correctly, it is impossible for anyone, especially unsupervised children, to fall into the water. Cuts down on evaporation of pool water, saving money on water costs. Pricey, in the $2500-$8000 range. Very visible. If you have anything other than a rectangular pool, the track for the cover has to sit above ground, along with the lid for the box. 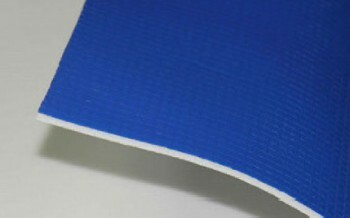 Depending on your needs, the high visibility of the cover’s mechanisms could be unattractive. It is also a trip hazard. You can find some more information on automated pool covers here. Thermal blankets are made of an insulating foam material, and though they cost a bit more than bubble covers, roughly $900-$3000 range, they do insulate better than solar covers. Reduces evaporation up to 98%, insulating the water, thereby extending the swimming season. Easy to use and put away. Thermal covers can be accessorized with a roll-up station and wind protection devices. Lasts longer than solar pool covers. Can be left out in the sun without danger of damaging the cover. For the most part, customers who buy winter pool covers are closing their pool for the winter season, however winter covers can be used year-round. Made from a polyethylene fabric, these covers keep out winter winds, precipitation and extreme temperatures that can cause frost damage. They are relatively inexpensive, ranging in price from $150 – $700 and prevent a nasty cleanup in the spring by keeping out dirt, leaves and other debris. Installation is relatively easy. The covers are sewn at the factory and come in their final shape and size. 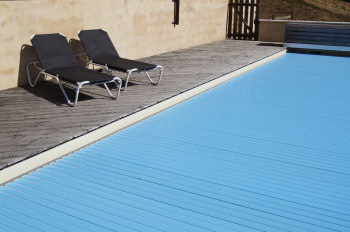 They are designed to overlap the sides of the pool to aid in keeping out dirt and debris, and is further sealed at a fixed point approximately every 800mm. Anchor points around the pool must be installed for the cover. Reduces effective sunlight, thereby limiting the growth of algae, which leads to expensive cleaning and maintenance. Lightweight and easy to roll out and roll up. Does not heat water, retain heat or reduce as much evaporation as other blankets. Requires anchor points to be installed around the perimeter of the pool. Can’t be easily taken on and off – not good for everyday use. If aesthetics are important, hidden pool covers are a great option. 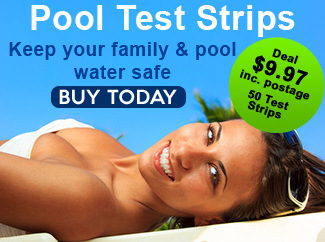 They have the added bonus of being able to be installed on new or existing pools, and those under renovation. Hideaway covers come manual, automatic or semi-automatic, which makes them very easy to use while at the same time fulfilling all the savings and protection you’d expect from a swimming pool cover. Rolls directly on the water automatically or semi-automatically, or manually by use of an easy-to-use hand crank. Ascetically pleasing. When it’s put away, it’s not noticeable like other covers are. Can be expensive- especially the automatic ones. Can be difficult to install in existing swimming pools. Deciding which pool cover to get can be one of the most important decisions you make when it comes to the extra enjoyment and money savings you will get from your pool. For most people a solar swimming pool cover offers great benefits and they are great value – click here to learn more. Our advice is to consider all the options so you can make the best choice for your situation.